For this trip, I transferred from the J train to the 7 train. The two lines do not have a transfer point at any station — so I had to walk seven or eight miles to make the transfer. After a few weeks trampling about southern and western Staten Island, visiting Prince’s Bay, Travis and Charleston, I was in the mood to travel through more urban scenes and starting in Williamsburg, which has been built up for over a century and a half, fit the bill pretty well. I decided to travel through the Willie, into Greenpoint’s eastern reaches, and then cross the noxious and noisome Newtown Creek into Sunnyside. 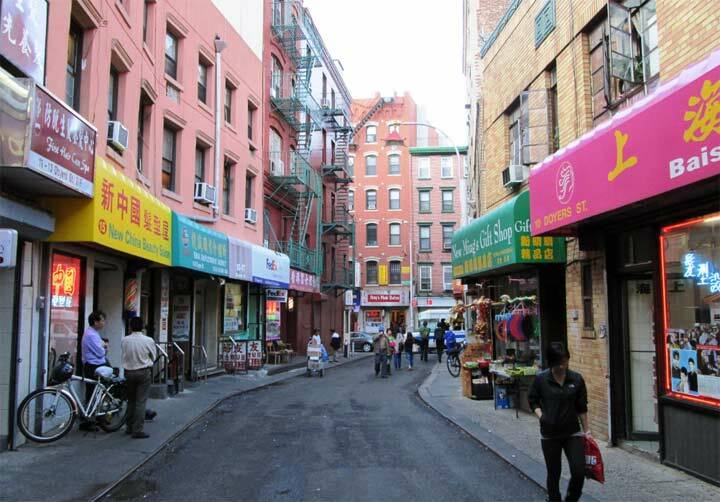 Probably no avenue in Williamsburg has undergone as many wholesale changes as Union Avenue, as a string of expensively-priced rental and condo buildings have sprung up, replacing old walkups, garages and repair shops that used to line the north-south route, under which runs the IND G train. There are still remaining swatches of Union Avenue that remind you that this was once more of an industrial/working class neighborhood, such as this Belgian blocked sidewalk that once led into a now-demolished warehouse south of Withers Street. Like Our Lady of Mount Carmel Church on Havemeyer Street (seen in Part 2 linked above), Bamonte’s Restaurant is another reminder of Williamsburg’s now-relatively small Italian district. The restaurant opened in 1900 and has been operated by the same family since then. It was first opened as a catering hall by Pasquale Bamonte and finally became a full service restaurant in 1950. Sandwiched between two townhouses, it is the only commercial business on the block; its lighted sign is a unique beacon on an otherwise residential street. 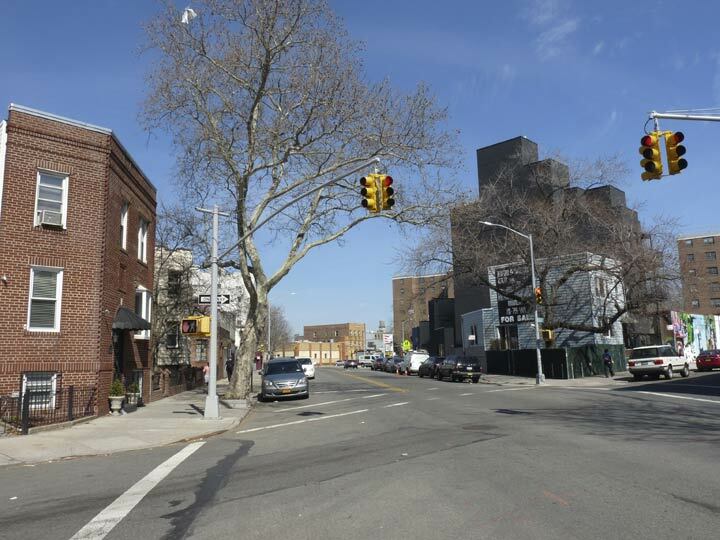 Withers Street is a forgotten stretch of North Williamsburg, an Italian enclave gutted decades ago by the Brooklyn-Queens Expressway that now runs through it. With little evidence of its former self, save a couple of ethnic churches and organizations, Bamonte’s serves as one of the last pieces of this former immigrant neighborhood. “Back in the day” Bamonte’s was frequented by Brooklyn Dodgers Leo Durocher and Pee Wee Reese, as well as the Yankee Clipper Joe DiMaggio. It has been used in scenes in The Sopranos, Kojak and other TV shows and films. This row of tidy attached brick buildings stands opposite Bamonte’s on Withers Street. While the Llama Inn might be the new kid on the block at Withers and Meeker Avenue, the Night of Joy is the more established spot. One may wonder how much the name of the joint was influenced by a strip joint found in John Kennedy Toole’s classic A Confederacy of Dunces. If you went strictly by the Department of Transportation sign, you’d think that the little wedge park on the east side of Meeker Avenue at Withers was named for a man named Badame Sessa. Not quite: the monument in the park has a hyphen between the names, which makes clearer that it is named for two soldiers: Pvt. Michael Sessa (1948-1967) killed in a battle in Vietnam, and Sergeant George G. Badame (1896-1955) who served in WWI with distinction, earning a Purple Heart for bravery. 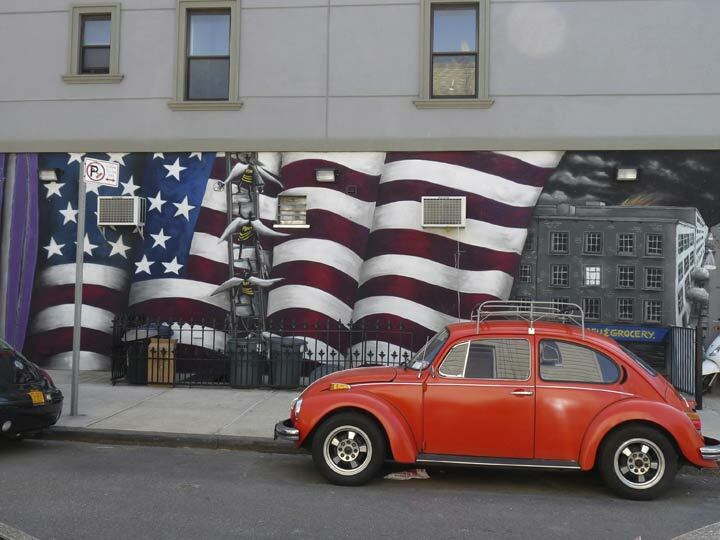 Patriotic building art and a classic VW bug at Withers Street and Manhattan Avenue. 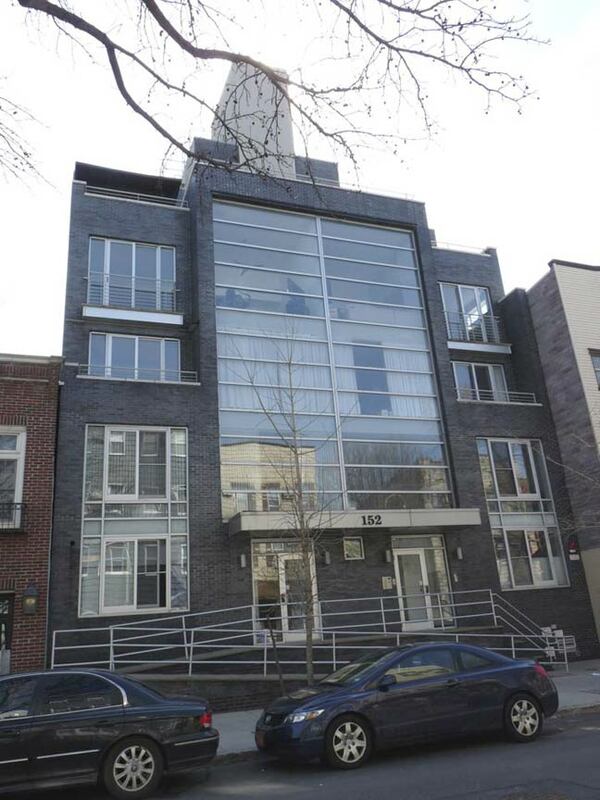 Most of Withers Street is lined with aluminum-sided frame or exposed brick buildings, but #152 is a new addition. I’m not sure how many apartments are divided behind that huge single window in the center. Unusual tableau at Withers Street and Graham Avenue, a triptych “Stay Together Friends and Family People of New York.” Unusual to my eyes as everyone in the drawing is of the Caucasian persuasion in polyracial Williamsburg. 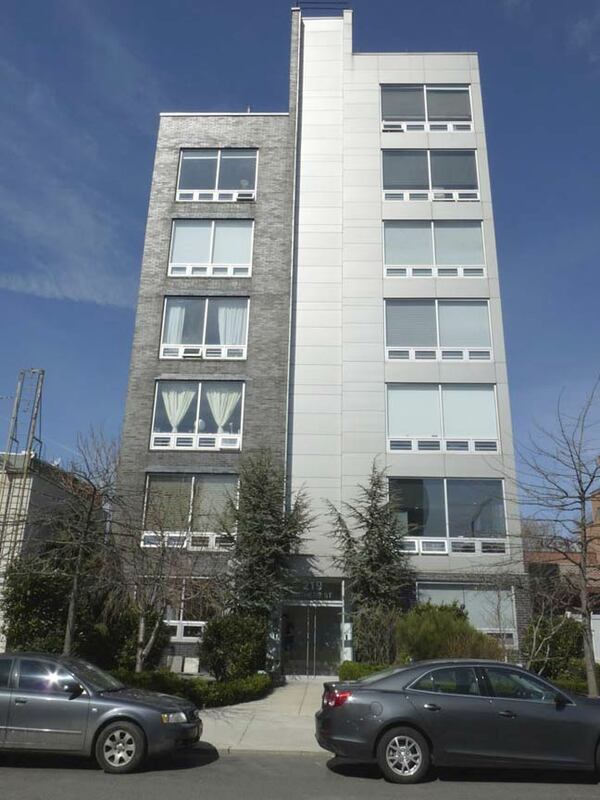 219 Withers, east of Humboldt, is a new high-rise building in an area where zoning was not written to prevent them. Will buildings like this eventually squeeze out the aluminum-paneled low-risers that currently dominate Withers and its parallel streets? 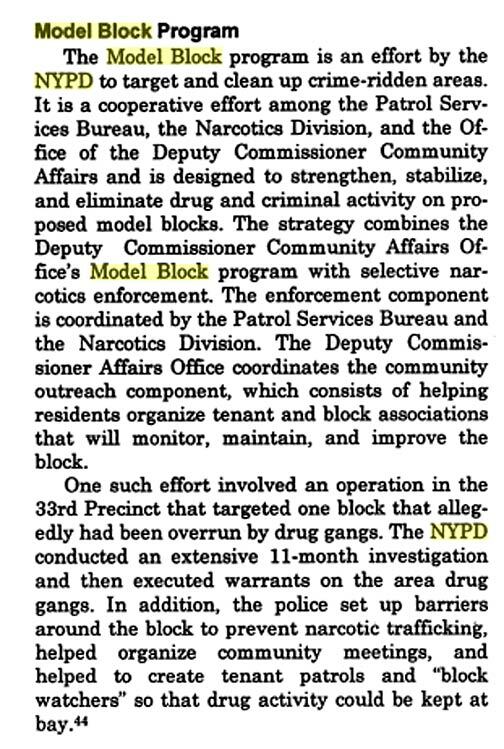 Withers between Humboldt Street and Woodpoint Road long ago was awarded a Model Block award from the NY Police Department. 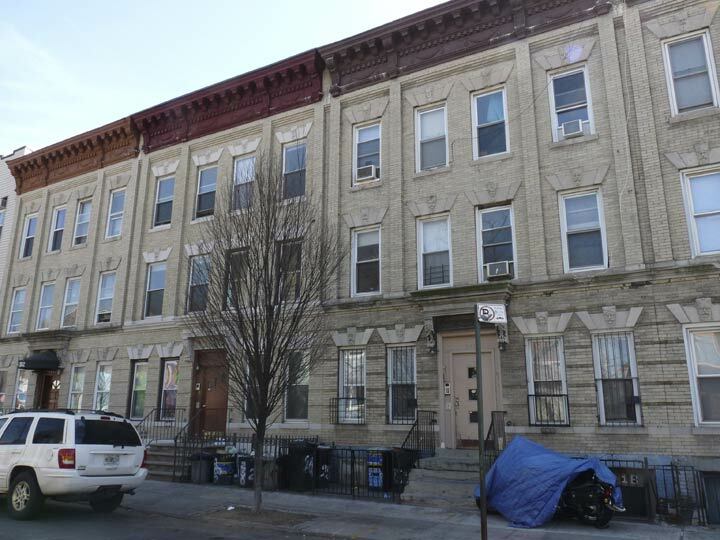 Given that much of Williamsburg was in a sorry state from the 1960s and into the 1990s, earning a “model block” award was some kind of an accomplishment. 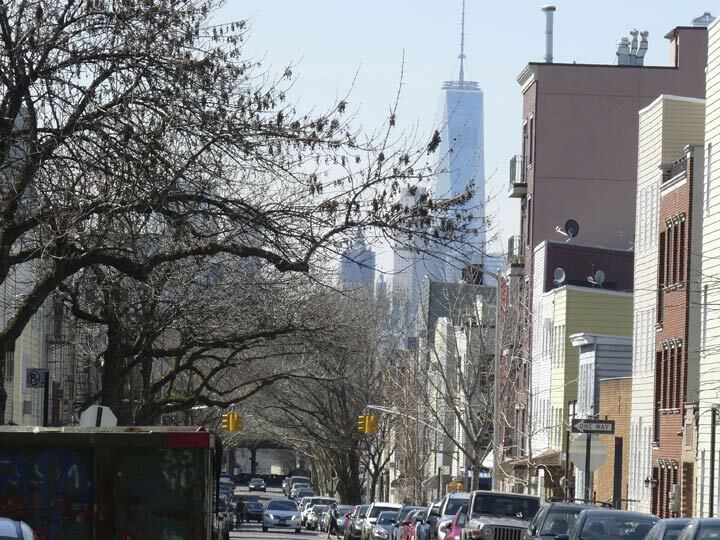 One World Trade Center, visible from most parts of town, is prominent looking west on Withers Street. Woodpoint Road is one of the more interesting curios in the East Willie. 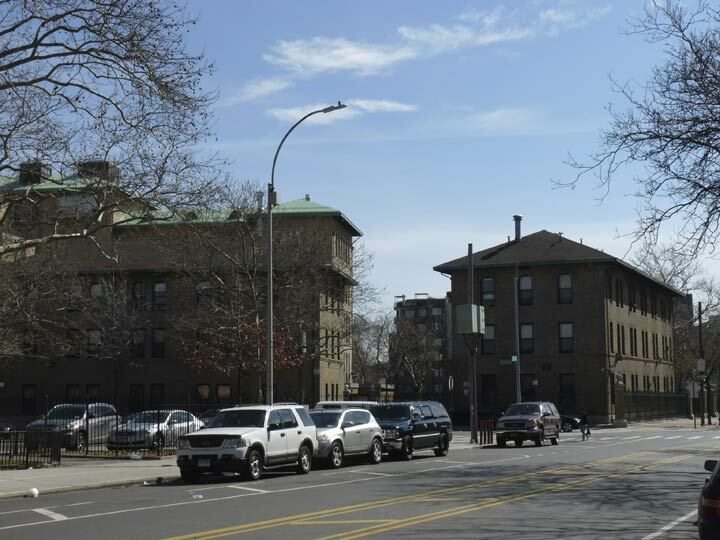 Seen here at Withers Street, it runs in a curved route from Kingsland Avenue at Frost Street generally south to Maspeth Avenue, where it gains a couple of lanes and becomes the bruising Bushwick Avenue, which bullets its way in a straight line southeast to Jamaica Avenue in East New York. 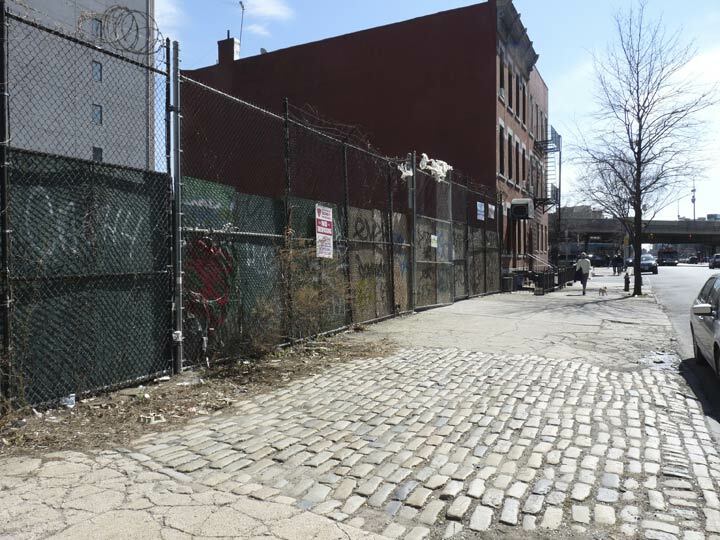 It is the last section what was once a much longer route that began in the colonial era at Norman’s Kill, an inlet now called Bushwick Creek, to the Old Bushwick Road (which has since been straightened, more or less, into today’s Bushwick Avenue). 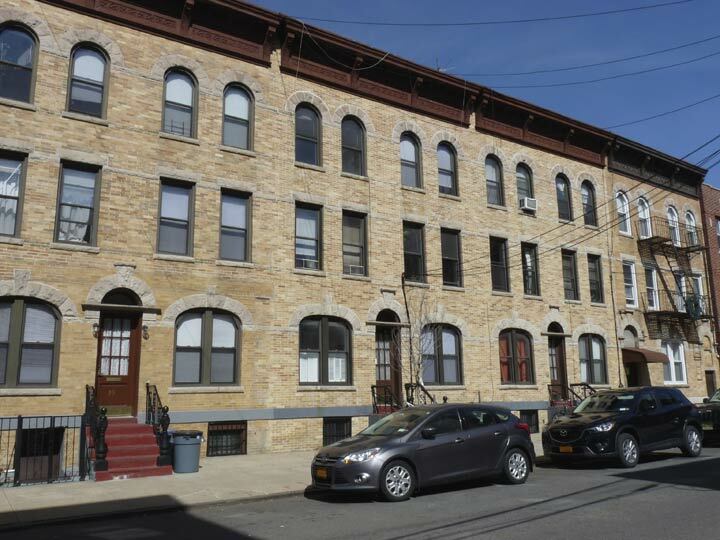 Woodpoint Road once began at the point where the creek once extended, today’s Driggs Avenue and North 14th Street, and meandered southeast, joining another branch that originated in northern Greenpoint. The centuries have erased all of it except for this section. The east end of Withers Street is replete with street art. This batch was likely commissioned by coffee joint Tar Pit, on Woodpoint Road. Attached brick walkups on south side of Withers, east of Woodpoint. 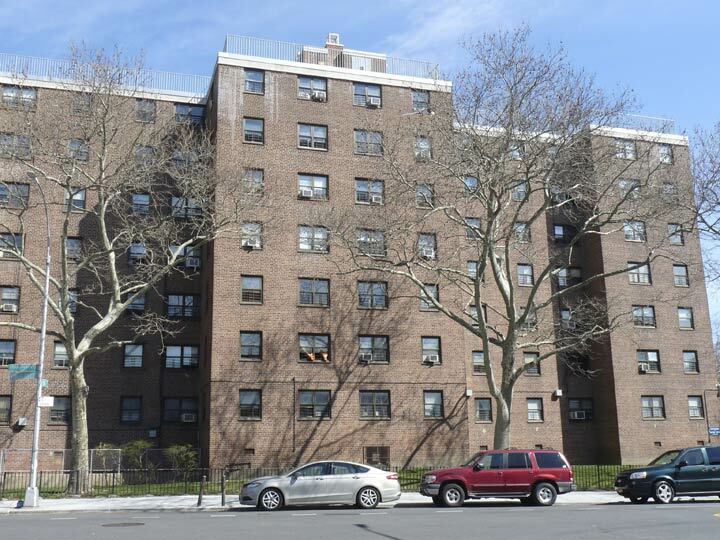 I lived in a building quite similar in Bay Ridge between 19… ah, let’s say it was awhile ago. 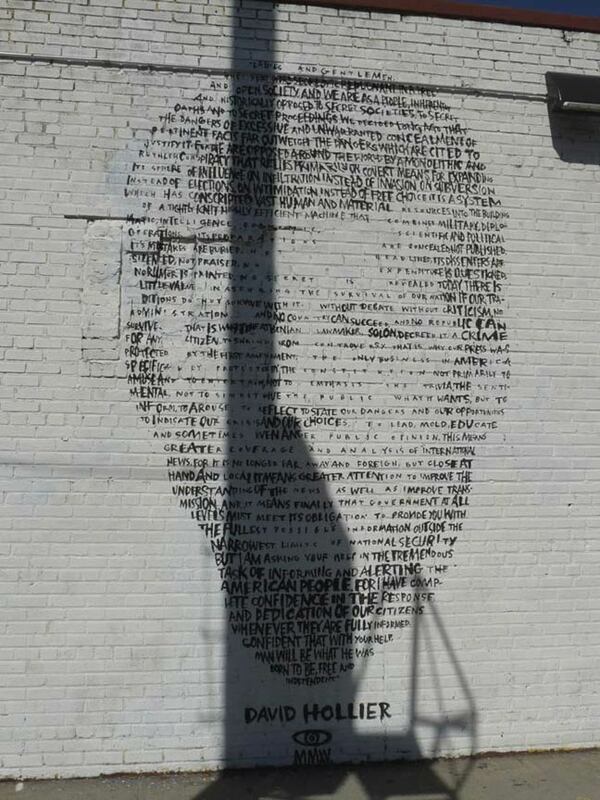 The art on this building changes periodically, if you check Google Street View. Likely the first pairing of Audrey (“Breakfast at Tiffany’s”) Hepburn and Pink Floyd. This image of John F. Kennedy was formed by artist David Hollier by lettering in the words of JFK’s speech to the Newspaper Publishers Association at NYC’s Waldorf-Astoria Hotel on April 27, 1961. At Kingsland Avenue, Withers Street is stopped cold, though there is a short piece a couple blocks east of here, by the Cooper Park Houses, named for nearby Cooper Park, in turn named for industrialist Peter Cooper, the founder in the 1850s of Cooper Union, NYC’s premier technological school in the East Village. His name turns up in these parts because in the same decade, he ran a rendering plant on Newtown Creek that produced the first edible gelatin. Yes, Peter Cooper is the ultimate inventor of Jell-O®. Just south of here are the decrepit buildings of the former Greenpoint Hospital, awaiting repurposing except for the outpatient center at the corner of Kingsland and Maspeth Avenues, now the Greenpoint Renaissance Center, which has converted some of the buildings to affordable housing. The buildings functioned as a hospital for 72 years, between its 1912 opening and closure in 1984. In the 80s and 90s, the buildings served as a homeless center. 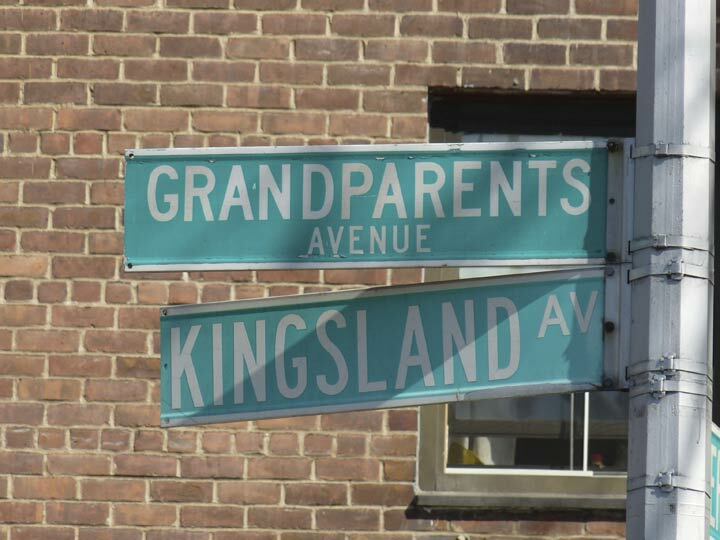 By the early 1980s Kingsland Avenue had gotten the extra moniker Grandparents Avenue. When I was a kid, I remember asking my mother, with complete naive sincerity, why there wasn’t a Kids’ Day, since there was a Mother’s and Father’s Day. “Every day is kids’ day,” she replied, wearily.